The Lake District, also known as The Lakes or Lakeland, is a mountainous region in North West England. A popular holiday destination, it is famous for its lakes and its mountains (or fells), and its associations with the early 19th century poetry and writings of William Wordsworth and the Lake Poets. The central, and most visited, part of the area is contained in the Lake District National Park, one of fifteen National Parks in the United Kingdom and the largest National Park in England . It lies entirely within Cumbria, and is one of England's few mountainous regions. All the land in England higher than three thousand feet above sea level lies within the National Park, including Scafell Pike, the highest mountain in England. The Lake District is approximately 34 miles (55 km) across. Its features are a result of periods of glaciation, the most recent of which ended some 15,000 years ago. These include the ice-carved wide U-shaped valleys, many of which are now filled with the lakes that give the park its name. The upper regions contain a number of glacial cirques, which are typically filled with tarns. The higher fells are rocky, with lower fells being open moorland, notable for its wide bracken and heather coverage. Below the tree line, native oak woodlands sit alongside nineteenth century pine plantations. Much of the land is often boggy, due to the high rainfall. The Lake District is one of the most highly populated national parks. Its total area is near 885 square miles (2,292 km2), and the Lake District was designated as a National Park in 1951. The north-western area stands between the valleys of Borrowdale and Buttermere, with Honister Pass joining the two dales. This area comprises the Newlands Fells (Dale Head, Robinson, Catbells) and the ridge joining them. To the north stand Grasmoor, Grisedale Pike and the hills around the valley of Coledale, and in the far north-west is Thornthwaite Forest and Lord's Seat. The fells in this area are rounded Skiddaw slate, with few tarns and relatively few rock faces. The western part is the area between Buttermere and Wasdale, with Sty Head forming the apex of a large triangle. Ennerdale bisects the area, which consists of the High Stile ridge north of Ennerdale, the Loweswater Fells in the far north west, the Pillar group in the south west, and Great Gable (2,949 feet / 899 metres) near Sty Head. Other tops include Seatallan, Haystacks and Kirk Fell. This area is craggy and steep, with the impressive pinnacle of Pillar Rock its showpiece. 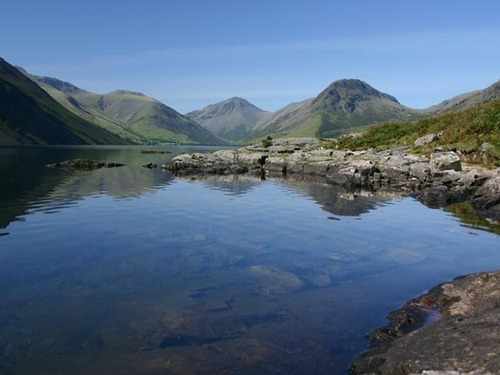 Wastwater, located in this part, is England's deepest lake. Rising up around the Western Valley of Wasdale is Scafell Pike, England's highest mountain. The central part is the lowest in terms of elevation. It takes the form of a long boot-shaped ridge running from Loughrigg Fell above Ambleside—a popular tourist destination—to Keswick, with Derwent Water on the west and Thirlmere on the east. The Langdale Pikes, with High Raise behind them, are another feature popular with walkers. The central ridge running north over High Seat is exceptionally boggy. The eastern area consists of a long north-to-south ridge—the Helvellyn range, running from Clough Head to Seat Sandal with the 3,118-foot (950 m) Helvellyn at its highest point. The western slopes of these summits tend to be grassy, with rocky corries and crags on the eastern side. The Fairfield group lies to the south of the range, and forms a similar pattern with towering rock faces and hidden valleys spilling into the Patterdale valley. It culminates in the height of Red Screes overlooking the Kirkstone Pass. The far-eastern fells lie on the other side of Patterdale and are characterised by steep sides leading up to a huge moorland plateau, again on a north–south axis. High Street is the highest point on the ridge, overlooking the hidden valley of Mardale and Haweswater. In the south of this region are the fells overlooking Kentmere, and to the east is Shap Fell, a huge area that is more akin to the Pennines than the Lakes, consisting of high flat moorland. The mid-western fells form a triangular shape, with the corners at the Irish Sea, Borrowdale and Langdale. They comprise the Wastwater Screes overlooking Wasdale, the Glaramara ridge overlooking Borrowdale, the three tops of Crinkle Crags, Bowfell and Esk Pike overlooking Langdale and Scafell Pike in the centre, at 3,209 feet (978 m) the highest ground in England. Scafell one mile (1.6 km) to the south-west is slightly lower but has a 700-foot (210 m) rock face on its north face, Scafell Crag. The valley of Eskdale penetrates this upland wilderness. These fells are the most rugged and craggy of all, and consequently going is slower amongst the tumbled granite. The south-western fells have as their northern boundary the Hardknott and Wrynose Passes. These are particularly narrow and steep, with tight hairpin bends. The Furness Fells (invariably referred to as the Coniston Fells by walkers) stand between Coniston and the Duddon Valley, which runs NE-SW through the centre of the area. On the other side of the Duddon is Harter Fell and the long ridge leading over Whitfell to Black Combe and the sea. The south of this region consists of lower forests and knolls, with Kirkby Moor on the southern boundary. The south-western Lake District ends near the Furness peninsulas, which leads to Cumbria's second largest settlement (Barrow-in-Furness). The Castlehead field centre is in this area. The south-eastern area is the territory between Coniston Water and Windermere and east of Windermere. There are no high summits in this group; it is mainly low hills, knolls and bumpy terrain such as Gummer's How, Whitbarrow and Top o' Selside. The wide expanse of Grizedale Forest stands between the two lakes. Kendal and Morecambe Bay mark the edge. Where is Lake District located ? With more than 3,500 kilometres of rights of way, you can walk, cycle and ride around the beautiful Lake District countryside to your heart's content. And of course you can also get on the water of our lakes and coastline. You can walk freely over 55 per cent of the National Park, thanks to Open Access and CROW. Academy-award winning Aardman - the makers of Wallace and Gromit - are promoting the Countryside Code using Creature Comforts characters and countryside sets of moorland, coast and farmland. To find out more, check out The Countryside Code website (opens in new window). This rolled-up coil of a sausage is sold by weight or length. There are many theories as to its distinctive shape. One possibility is the shape was introduced during Elizabethan times by German miners who worked in the Lake District. Find out more from the Cumberland Sausage Association (opens new window). Originally damsons came from the area around Damascus. Damsons have been grown in Westmorland since the early 1700s. The Westmorland damson is a member of the plum family. Its unique flavour is caused by cross pollination with wild sloes and also the favourable Cumbrian climate. In springtime, the white blossom of the damson orchards fill the Winster Valley and Lyth Valley, east of Windermere. The fruit is harvested in September. Damsons are used to flavour wines, gin, pies, cheeses, chocolate, bread, jams and beer. Find out more at the Westmorland Damson Association (opens in new window) which runs the Damson Day festival. This secret recipe was created by Sarah Nelson in 1854. It’s a unique product, between a cake and a biscuit and nothing like crisp gingerbread used for gingerbread shapes. You can buy it from the Grasmere Gingerbread Shop (opens in new window) in Grasmere village next to the church. Herdwick lambs grow slowly because of the harsh Lake District climate on the higher fells. This makes the meat sweeter and fuller in flavour. It’s at its best between January and May. This slice of peppermint flavoured congealed sugar has been giving an energy boost to walkers and climbers in the Lake District for over a century. It even made it to the top of the world in the 1953 Everest expedition. This is made by mixing butter with rum, nutmeg and brown sugar. There was an ancient custom to serve it to celebrate the birth of a new baby, where visitors would leave coins in the butter bowl to symbolise bringing a prosperous life to the baby. How to get to Lake District ? Towns and villages such as Ambleside, Windermere, Coniston and Keswick are linked by bus, with extra services in the summer. Our give the driver a break leaflets show maps, timetables and great ideas for days out by bus, train and even boat. Or pop into one of our information centres for details of travel packages, ticket deals and bus services. email: hq@lakedistrict.gov.uk or fill in our Contact Us Form. Office opening hours: Monday - Thursday 9am - 5pm and Friday 9am - 4.45pm. Please check in advance if you wish to contact a specific member of staff. Lake District Visitor Centre at Brockhole web page for more details. Coniston Boating Centre web page for more details. For contact details and a Ranger Area Map, please look at our Rangers page. If they are busy, please leave your message and a contact number and they will call you back. or check out our Latest News section. For website enquiries please call 01539 724555. For general enquiries ask the operator directly. We want to provide high quality services at all times - please see What can you expect from us? If you feel any aspect of our service has been at fault we want to know about it and investigate. A complaint can be any dissatisfaction you, or other members of the public, experience about the standard of a service we provide.